This entry was posted in Community, Theatre and tagged christmas, College of Liberal Arts, Theatre on November 1, 2011 by Wire Eagle. AUBURN – The Auburn University Theatre in the College of Liberal Arts will present the Christmas play, “Season’s Greetings,” premiering Nov. 10 at the Telfair Peet Theatre. 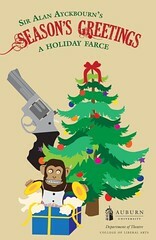 The dark comedy, directed by Christopher Qualls, showcases a typical suburban English family during an atypical Christmas gathering. The Alan Ayckbourn favorite follows couple Belinda and Neville as they host their dysfunctional relatives at their home for Christmas festivities. Guests include senile uncle Harvey, Neville’s sister Phyllis, her husband Bernard who delights and scares children with his annual puppet show, Eddie and his pregnant wife Pattie, Belinda’s sister Rachel and a suave writer named Clive whose immediate attraction to the married Belinda causes quite a scene one night under the Christmas tree. “Season’s Greetings” features scenic design by visiting artist Wes Peters, lighting and costume design by faculty members Fereshteh Rostampour and Tracy Oleinick and sound design by Kelly Walker. Cast members include Chelsea Allen, Winn Carrol, Anna Caudle, Marcus Clement, Jack Heflin, Eli Jolley, Sarah-Jean Peters, Harrison Smith and AnnaClaire Walker. “Season’s Greetings” runs Nov. 10-11 and Nov. 15-18 at 7:30 p.m. with a matinee performance Nov. 13 at 2:30 p.m. Tickets may be purchased online at www.auburnuniversitytheatre.org, or by phone at (334) 844-4154. Tickets are free for students and $15 for the general public.